Location. The Iowa Hill district is in central Placer County in the vicinity of the old mining town of that name. It is an extensive placer-mining district that includes the Roach Hill, Monona Flat, Strawberry Succor Flat, Grizzly Flat, Shirttail Canyon, and Forest Hill areas. History. 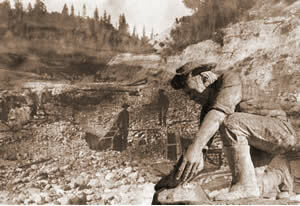 Placer mining began along the American River and its tributaries soon after the beginning of the gold rush. Hydraulic and drift mining apparently began here in 1853, and by 1856 the output was as high as $100,000 per week. By 1880 more than $20 million had been produced from the district. Drift mining continued through the early 1900s, and there was appreciable activity again in the 1930s. Most of the town was destroyed by fire in 1922. The Big Dipper, Occidental and a few other mines have been intermittently worked in recent years. Also snipers and skin divers have been active in the district. Geology. A main Tertiary channel of the American River crosses the area. There are numerous branches and intervolcanic channels, including the Succor Flat intervolcanic channel, which comes in from the northeast, and the west-trending Morning Star and Grizzly Flat deep channels. The deep channel gravels are well-cemented and in places yielded � ounce of gold or more per yard. The lowest seven feet were the richest but there also were some rich benches. The bedrock is uneven, and consists of hard slate and phyllite of the Cape Horn Formation (Carboniferous) and amphibolite, which contains a number of deep and rich potholes. To the east the gravels are overlain by thick beds of andesite. There are a few gold-quartz veins in the district. Mines. Big Dipper $1.2 million, Blue Wing Quartz, Brunn, Buckeye, Campbell, Canyon, Carey, Copper Bottom, Dewey Cons., Drummond, Elizabeth Hill, Excelsior, Fitzpatrick, Gleason $1 million+, Golden Star, Golden Streak, Goodwin, Haymes, H and H, Iowa Hill, Irish and Bryne, Jupiter, Keystone, King's Hill Point, King's Hill Quartz, Lebanon, Mohawk, Morning Star, Occidental, Old Jupiter, Penn Valley, Randall, Roach Hill, Star United, Strawberry, Twenty One, Welcome, Winchester, Wisconsin Hill, Union.